CULTURE for micro CREDIT CmC is a foundation organizing micro credits for women in Burma. Zondag 28 november van 12:00 tot 14:00 geeft John, eigenaar van cafe de Magere Burg in Amsterdam, gelegenheid onze 4de CmC kalender te presenteren en foto's te exposeren. Ook dit keer biedt hij de eerste koffie aan ons aan! Vrienden gaan heerlijke taarten bakken, dus... en ik zal een kleine update geven over de projecten in Birma. Vooral is het de bedoeling een gezellig positief samenzijn te realiseren en veel kalenders te verspreiden! De foto's blijven tot eind van het jaar hangen bij John, daarna verhuizen de prints naar de UvA Oude Manhuispoort. Laat je weten of je ook kan komen? A warm "Mingalaba" to all my friends! We have recently returned to Thailand after a long and beautiful journey through Burma, with time spent delivering your generous donations and establishing new projects across the country! Micro credits have proved to be an overwhelming success! Word has spread swiftly through towns and villages, leading to the number of loans being approved more than doubling in less than seven months. We couldn't have hoped for more! Micro credits have allowed the local people to implement simple but effective business ideas, providing not only much needed income, but also a sense of pride and empowerment. We now have almost 200 families across Burma, benefiting from loans, creating them all a more stable present and a brighter future. Further to the loans, all the children of those participating in the scheme are offered the opportunity to win a financial reward if they gain top grades in school, thus encouraging excellence in education. There are too many tales to tell, but we have selected some special stories and my friend has done a great job writing them down. At the end of the email you can find these success stories! Most importantly we would like to express our thanks to the people of Burma, who have dedicated themselves to making this scheme a success, choosing applicants, ensuring 100% repayment, meticulous accounting, auditing and more. We are so very proud of their achievement - we couldn't have done it without them! With Christmas coming and the New Year fast approaching it is time to promote our 2010 calendar! Our goal for the new year is to establish a large network in one of the poorest areas of Burma - it will be a huge undertaking and to succeed we will need your help! $100 is the average size of one loan, and makes the difference between a family just surviving, to a family flourishing. One calendar builds a block towards providing this - and so we think makes for a perfect Christmas gift! It would be wonderful if you could forward this letter to friends and family you think would be interested in supporting this goal! Finally our deep thanks and warmest wishes to you all - without your generous support, none of this would exist! And here the stories, thanks Sara! Reaching her mid twenties and still unmarried, Kyi Kyi decided that she wanted to pursue a life beyond the small town where she grew up. Having completed high school a number of years previous, she decided to resume her studies, this time in an external learning program specializing in Law. To help meet the additional school fees, Kyi Kyi rented a sewing machine and utilizing the skills she had learned from her mother, spent free time producing curtains, sheets and other household items for neighboring families. Her enterprise was a success, but the cost of rental was high and had no long term benefits. With this in mind she applied for a micro credit of 100,000 Kyat. The loan allowed her to buy herself two second hand machines, each with a separate function that allowed her to broaden the range of products she was able to produce. The hard work paid off, and her smart scheme enabled her to finance her education and repay the loan. Today Kyi Kyi has recognized her dream and is living in the city, working in a law firm. Before leaving home, she passed on the machines to her sister, who works as a teacher, but learning from her siblings success, supplements her income by continuing the sewing business. Mo Kyaw’s mother died of Tuberculosis twenty years ago when he was only 12 years old. With his father also sick and unable to work, responsibility fell to him to remain at home and look after his family, rather than going to the city to pursue further studies. As the years passed his young sisters grew up and left home to live far away and start a new life with their husbands. With fewer burdens, Mo Kyaw realized he wanted to create something to ensure his own prosperous future. Throughout his life he had been very close to his grandfather, who was a local barber and had never had a son of his own. He had spent many years watching his grandfather at work, and slowly learned the trade, one that had been handed down from generation to generation and now, finally, to him. After being awarded a micro credit loan of 100,000 Kyat, Mo Kyaw was able to rent a small space and buy a second hand chair and mirror with which to start his own shop. With a flair for hair and showing great skill with his scissors, his shop soon became a popular spot for his peers to visit and updates their looks. Today, with the loan repaid and a flourishing venture, Mo Kyaw is looking forward to taking on an assistant and growing his business a few steps further. Daw Ma Sein lives in a small town in Northern Burma and until recently her husband was the family’s sole provider. He earns a small but stable income as a Tri-Shaw driver, transporting people and goods round the town and neighboring villages. The couple has three sons, the youngest of whom survived polio as a toddler, but was left with severe physical and mental handicaps that require constant care and attention. Despite their relatively poor background, Daw Ma Sein wanted her children to have the best possible start in life, and on completing high school, encouraged her eldest son to apply for a place at University in Mandalay. Needing to provide additional funds for a maturing family, whilst still needing to be at home to tend to her youngest son, she decided to apply for a micro credit loan. Daw Ma Sein was awarded 60,000 Kyat with which she purchased two young pigs and built a small barn for them on her land. Reaching maturity, the male pig was sold for 100,000 Kyat whilst the female gave birth to six healthy piglets half of which were sold at birth and the other half reared to adulthood and then sold for a higher price. From a simple idea and with the help of a micro credit, the family now has a long term additional source of income; enough to pay back the loan, support her son’s education and provide a better standard of day to day living. San San Aye was happy, hard working wife and mother, when three years ago, her husband died, leaving her widowed and with four children to support. Fortunately, the family had by this time established a popular noodle shop in the center of the local market. Using the restaurant profits she was able to continue to send the younger children to school and her eldest son to Russia to study engineering at a military academy. As her younger daughters matured and left school, times became more difficult, as more income was needed if she was to provide them with the same opportunities as her son. With an astute business mind, she knew that she wanted to continue what she did best, and there was room for another restaurant in the town. San San Aye applied for a micro credit loan and was awarded 100,000 Kyat. With this she set about renting a new premises, purchased kitchen equipment, food stuffs and new cutlery, bowls and cups. With little work available locally, one of her daughters was keen to manage the new business, having learned the trade from her mother. The plan was a success and now with two flourishing shops, the family was able to repay the loan and with additional profits the youngest daughter was able to take up a long distance university studies. Sara and I have obtained our visa for Burma and fly out to Rangoon soon! We hope to be one and a half month in Burma and maybe a month more than that. As most of you know, there is no phone connection possible and only limited internet available, so we will be mostly cut off from the rest of the world during that time! Lorna will read the CmC emails and she will help you, together with Anton on matters concerning calendars, press etc. As you know, Mark (whom Sara and I met in Burma), has walked the Colorado trail and sold miles for Burma. He is back, watch his splendid report: http://www.youtube.com/watch?v=2VfhxQUxfCQ Thanks Mark! Than, still to be run: NY Marathon, also for Burma! Good luck Miek, Luc, Bouke & Martin! Please see their message attached. When we get back, we give you the success stories! We have bought two laptops, we will bring to our village. I am so proud to tell you that all children of the school 'De Meander' in Holland have collected money with postcards made by themselves to support the school in our village! The second laptop will go to our project coordinators, so they can make good accounting of the micro credits. Sara and I will make picture and write stories about how the credits are successful, and how to improve. We will visit two villages where our projects run. I have received a letter of 15 pages, with accounts of our friend, he wrote me that we can be proud of the growth of the project, many more people from other districts know to find the cooperation, and many loans have been fully paid back already with the 2,5% interest. Thanks Guido for asking me for 20 calendars, even before they where there. Actually, his request made us decide to make a 2010 calendar! I would like to thank Arantza for her generous support of $1000. We met in Shan state and have discussed for hours how to help the people with micro credits. I know she would love to visit our village and meet all our friends there. I hope she can in the near future, for now, she will have to do with my stories. And than to finish the mail: all the countries the calendar has arrived: Holland, Belgium, Germany, USA, Australia, Guatemala, Thailand, Burma, Norway, Israel, so far so good! STAD - Eind augustus is alweer de derde editie van de Burma kalender van de persen gerold. Deze kalender bevat foto's van Burma, gemaakt door fotografe San, die drie jaar geleden het initiatief heeft opgezet. Aanstaande donderdag heeft San een solo expositie in het Vijzelstraatmuseum. San is in 1997 in Burma begonnen met fotograferen. In de afgelopen jaren is ze regelmatig terug gegaan en heeft ze daar diverse projecten opgestart om micro kredieten te verlenen aan de mensen in Burma. De derde kalender is inmiddels een feit en voor een donatie van 25 euro of meer kunnen geïnteresseerden een exemplaar verkrijgen. De opbrengst gaat via Stichting Culture for micro Credit (CmC) naar Burma. Dit kan variëren van krediet voor een fietstaxi of een naaimachine tot het investeren in een aantal waterbuffels en geiten. Het initiatief is een succes: er zijn inmiddels meer dan 150 projecten die de fotografe de afgelopen drie jaar financieel heeft kunnen steunen. 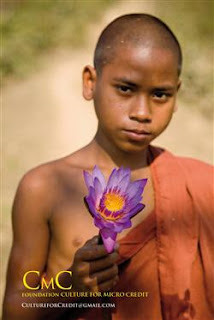 Dit jaar bestaat de kalender uit foto's van de bevolking uit de noordwestelijke staat Arakan, vlakbij Bangladesh. Met het geld dat deze editie van de kalender opbrengt, is San van plan twee laptops, een bromfietstaxi aan te schaffen en wat er nog meer nodig is om kleine ondernemingen in dit gebied op te kunnen starten. Opening solo expositie San voor Burma op 17 september van 17.30 tot 18.30 in het Vijzelstraatmuseum, Vijzelstraat in de passage. Kalender is ook te verkrijgen door minimaal 25 euro te doneren, mail naar: PicturesbySan@gmail.com. San is in 1997 in Burma begonnen met fotograferen. In de afgelopen jaren is ze regelmatig terug gegaan en heeft ze daar diverse projecten opgestart om micro credieten te verlenen aan de mensen in Burma. Nu is de derde kalender voor Burma van de persen gerold en voor een donatie van 25€ of meer kunt u ook een exemplaar verkrijgen. De opbrengst gaat via Stichting Culture for micro Credit (CmC) naar Burma.